Richardson Electronics makes it easy to replace failing CRTs. As a leader in the CRT replacement market, we maintain an extensive inventory and cross-reference database to allow customers to select new, off-the-shelf CRTs for systems and original equipment manufactured by Conrac, Coulter, GE, Hitachi, Siemens, Toshiba and many others. If replacing the CRT in a legacy system is not an option, Richardson Electronics' engineering and design team can develop solutions for existing legacy displays: either as direct CRT replacements or compact, energy-saving LCD equivalents spanning frequency ranges from 15 to 90 kilohertz. With interlaced and progressive scan timing, our legacy replacement solutions encompass the entire analog video signal spectrum. Description | Richardson Electronics offers a complete line of color open frame display products, including CRTs (Cathode Ray Tubes) from 1.5" to 23" and ruggedized monitors from 5" to 20". The products are capable of withstanding the harsh work environments of mining, food processing, material handling, utility companies and petrochemical control/processing. Extreme shock and vibration and high temperatures are normal for these applications. 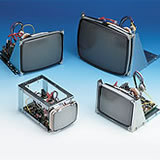 Description | Richardson Electronics offers a complete line of monochrome open frame CRTs (Cathode Ray Tubes) from 1.5" to 23" and ruggedized monitors from 5" to 20". These products are capable of withstanding the harsh work environments of mining, food processing, material handling, utility companies and petrochemical control/processing. Extreme shock and vibration and high temperatures are normal for these applications.